The Tengiz oil fields entered a new phase of production with the construction of its Second Generation Project (SGP) and the introduction of sour gas injection (SGI). This onshore development, which has been in the planning and approval stage since 2002, began in 2004 and required a total investment of $7.4bn. The integrated project was completed in the second half of 2008. The Tengiz field, first discovered in 1979, has recoverable reserves estimated at between six billion and nine billion barrels. The field was jointly developed in 1993 as a 40-year venture between Chevron Texaco (50%), KazMunaiGaz (20%), US ExxonMobil (25%) and LUKArco (5%). The joint venture company is known as TengizChevrOil (TCO). Chevron is the operator of the TCO field. Prior to its expansion in 2008, the Tengiz oilfield had 53 wells, tapping a column of crude oil around 1.6km thick. When the field was first tapped its oil pressure was 12,000psi, but in 2004 the pressure came down to 10,000psi in most areas and 8,500psi in others. The SGI project used gas injection technology to boost the pressure and increase oil recovery, while the SGP increased the number of producers (wells) and improved and expanded the crude export infrastructure. The Tengiz field’s production of crude in 2004 was 13 million tonnes per year but the SGI and SGP production increased this to over 25 million tonnes. TCO crude oil production capacity was increased by about 80% to 540,000 barrels of crude oil, 46,000 barrels of natural gas liquids and 760 million cubic feet of natural gas. The two projects created over 7,000 jobs in Kazakhstan and aided the development of the economy. A total investment of $20bn is envisaged for the duration of the 40 years of the Tengiz oil field venture. TengizChevrOil intends to export more of the Tengiz field’s additional capacity via the Caspian Pipeline Consortium pipeline running the 1,500km from Tengiz to the Russian Black Sea port of Novorossiysk (thus solving the export problem from the remote Tengiz field). The Tengiz expansion projects were almost completely shelved during a breakdown in relations between TengizChevrOil and the Kazakhstani Government in 2002. The terms of the expansion were initially part of the 1993 contract signed by all the concerned parties. The Kazakhstan Government warned that the project could be cancelled in November 2002 following a disagreement about how to fund it. The private partners wanted to use the profits from the oilfield to fund the SGI and SGP, which would have meant lower profits and hence lower taxes due on the profits. The Kazakhstan Government, however, was against this and wanted to maximise the profits in order to claim more money for the state. Following this major disagreement, many of the drilling subcontractors, including Parker Drilling Company of Houston, Texas, were ready to conclude their contracts and the field could have closed. The issues were resolved during 2003 negotiations when an agreement about funding of the new project was reached (90% foreign investment) and the tax situation clarified (the Kazakhstan Government receives a $200m a year payment and profits and tax percentages). TengizChevrOil were fined $71m for environmental transgressions imposed by the Tengiz regional government (Atyrau Oblast) late in 2002. The Supreme Court, however, reduced the fine to $7m on an appeal. This occurred because of changes in the way the central government collects taxes. In previous years some of the taxes were paid directly to the regional government where Tengiz is based. The central government decided in 2002 / 03 that all taxes should first be paid to the capital, Astana. Following this the Atyrau Oblast realised it faced a shortfall. It then had the idea of suing TengizChevrOil for damaging the environment. The fine was imposed for sulphur pollution. The sulphur concerned was already in elemental form stored in blocks around the Tengiz field and did not cause pollution. The sulphur blocks are now converted into pellets and sold on the world market as a valuable commodity. A new plant was constructed to convert potentially polluting sour gas (H2S) into sulphur pellets. In addition, the SGI system used up a significant proportion of the sour gas produced (sour gas disposal is one of the SGI’s secondary benefits). The reservoir of the Tengiz field is 3,657m (12,000ft) deep, making it the deepest operating oilfield project in the world. The scope of the SGI / SGP projects included installation of the largest single-train oil and gas separation facility. The field also has the largest single-train sulphur recovery unit and the first-of-its-kind high-pressure, high H2S gas re-injection facility. The SGP project involved construction of greenfield facilities such as crude oil export systems, crude desalting, sulphur recovery, crude stabilisation, gas processing, sour gas dehydration and LPG processing and storage facilities. A 435 mile railway line was also constructed along with utilities and offsite constructions. The SGI will inject sour gas into the reservoir at pressure of 10,000psi from the SGP to the compressor. The project also increases the oil processing capacity of the SGP by about three million tonnes. The projects required a workforce of 25,000 personnel at peak time construction. In December 2009 a four-year, $258m Gas Utilisation Project was completed at the field to reduce the natural gas flaring by 95%. TCO also completed a major project replacing the crude oil storage facilities in January 2010. De-bottlenecking of the plant was taken up prior to 2004. A fifth train was installed as part of the Second Generation Project in 2008. 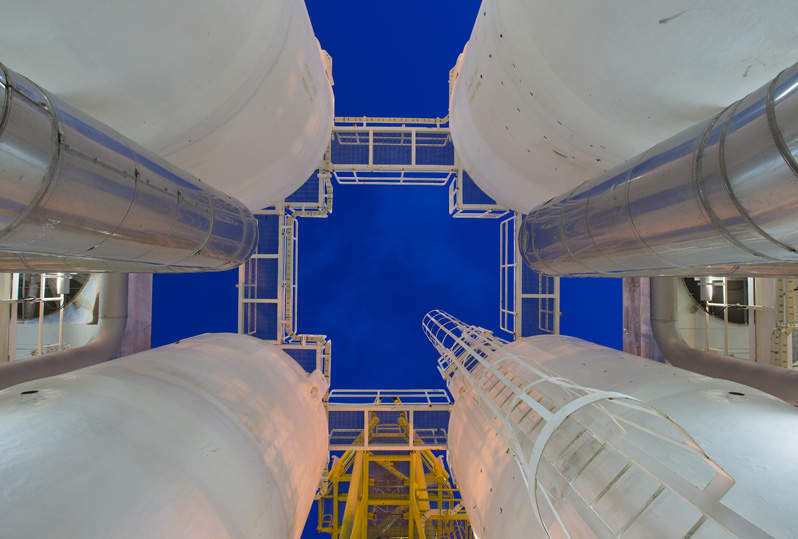 De-bottlenecking in past expansion led to the sulphur plant capacity exceeding requirements because H2S levels have in practice been not only lower than expected, but also lower than the plant was designed to handle. It was decided that there was sufficient margin to handle existing sour gas flows and the flow from a new train. The new fifth train has utilities, a plant-wide control room and a gas-processing plant that can handle excess gas from KTL 1 and 2 as well as the new train. The lead contractor for the engineering, procurement, construction, management (EPCM) of the SGP and SGI are PFD UK, a joint venture between Parsons Energy & Chemicals and Fluor Daniel Corporation. The terms of the agreed contract under government rules require that the lead contractors use at least 80% Kazakhstani labour during the project. Able Instruments and Controls provided the flow and level measurement instrumentation systems for the project. Heavy construction equipment were provided by Arctic Construction International (ACI) who also provided trained personnel to operate and maintain the equipment over the duration of the contract. Versatec Engineering provided engineering consultancy and safety consultancy throughout the duration of the project. Honeywell provided the automation for the project. The $92m crude oil storage tank replacement project was completed by Kazakhstani companies NeftesStroService, Byelkamit and Kazcomservice. All of the contractors were aware of the conditions in Tengiz, where the temperatures can vary from 36°C to -40°C. PFD UK held the majority of subcontracts and purchase orders for the project and was be responsible for the construction of major new infrastructure at the oil field including: a 6,500-bed construction camp, a new rail line spur, a new road between the construction camp and the SGP construction site. The major new facilities included a new field production gathering system and SGP process plant, oil refinery expansion, an SGI compressor plant, and new product export infrastructure (gas export pipe-line, additional crude storage, LPG storage) and a sulphur forming plant (to convert sour gas reserves to usable sulphur products for export such as elemental sulphur pellets or sulphuric acid). The main part of the project was eight injectors for the SGI project and 39 new drilling wells as the second generation project. Trial injections for the SGI system began in the third quarter of 2004 and continued for up to 18 months before the full scale injection system was implemented (the compressor plant was completed by then). This supplier provided and installed gas and liquid clamp-on ultrasonic flow meters (maintenance free), nuclear level instrumentation, and radar and guided wave radar (GWR) level transmitters. A total of 135 radar and GWR instruments were required, but there was an option for RF admittance level transmitters for applications that were not suitable for radar or GWR. The radar installations were installed under a two-wire, loop powered, intrinsically safe basis and used in oil, gas and sulphur recovery areas and also in underground facilities (liquefied gas storage). Wide beam ultrasound transmission is used to allow operation under wet conditions and the required accuracy over a wide range of flow rates. Varied nucleonic level gauging for the project requires interface control on separator vessels and foam detection on flash drums. Able supplied their state-of-the-art gauging technology along with a team of flow meter and instrumentation engineers to make the system run smoothly.